Make calls, receive and send SMS from PC using Android phone is quite helpful for those people who spends a lot of time in front of their computer. If you are at your work or office, then it is always not possible to use your smartphone to send a message or to make a call. Taking the phone again and again might interrupt your work. Or, maybe you have forgotten your phone at home and you have to send an important SMS to your client, then what will you do? My point is that one may face difficulties from switching one screen to another. How it will be, if you can perform all these tasks like make calls, receive and send SMS from PC using Android phone? This would be really helpful for the computer working peoples. How to Receive and Send SMS from PC using Android? Today I am going to introduce a new app called MightyText. It is an Android based app that allows you to remotely control your phone from anywhere in the world. This app requires the Internet to perform the task. If your phone has an Internet connection, then you can make a call, send a message, view your gallery and send any file from computer or tablet using your Android phone. While your boss will think that you are diligently typing notes on your computer, in reality you’ll be texting. 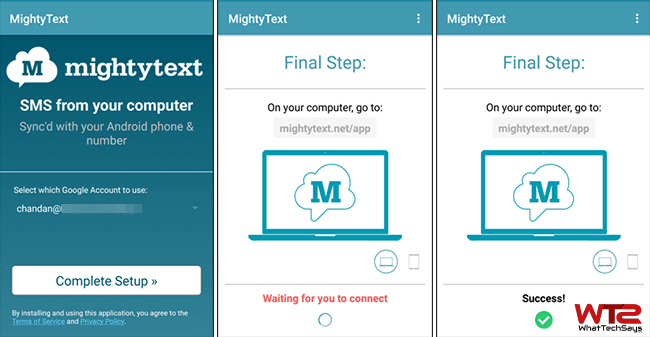 To use all these features on your computer, first download the MightyText app from Google Play Store on your Android phone. It is available as a free download. When you run it first time on your phone, tap on the “Complete Setup” button to link your Google account with this app. This is the registration process. After allowing this app to access your Google account, you are done from phone side. Now you need a Tablet or Computer to access your phone. Open any web browser on your computer and open this URL: https://mightytext.net/app. You will be asked to allow the same Google account that you had used while setting up the app on your phone. Once you log in, you’ll be able to make calls, receive and send SMS from PC using Android phone also manage your contacts, photos and videos. It also shows you the battery percentage of your phone. MightyText has also some paid features. Let’s know all free and paid features. [appbox googleplay appid com.texty.sms] 1) You can read, reply and create a new message from your tablet or computer remotely. 2) You will get the notification on your browser while receiving a message or call on your Android mobile. 3) Easily make calls to your contacts. 4) Manage your contacts remotely. 5) Send any file from your office or anywhere to your phone. 6) You can manage your phone’s gallery such as photos and videos. 7) Uninstall your apps directly on the web browser. 8) Store your photos and videos on MightyText store. A free user will get 5GB and paid user will gat 100GB of storage. 9) You can schedule messages (Paid only feature). 10) Paid users also can change the theme, sync contacts and messages, use templates and many more. Most people can type faster on their computer than on their mobile phone, so you can say MightyText saves your time. You can only initiate a phone call from your computer, but still you need to physically pick up the phone to continue the conversation. Please remember that, MightyText only uses the Internet to control your Android phone, but standard messaging and calling rates will apply as per your SMS and call. In this way, you can make calls, receive and send SMS from PC using Android phone.